Prime Minister Justin Trudeau meets with Quebec Premier François Legault in Sherbrooke, Que., on Jan. 17, 2019. Prime Minister Justin Trudeau demonstrated a new willingness to help Quebec Premier François Legault temporarily reduce immigration to the province by more than 20 per cent, even as Ottawa promotes higher immigration as the key to a stronger economy. Mr. Trudeau and Mr. Legault discussed immigration issues Thursday during a private meeting in Sherbrooke, Que., where the federal Liberal cabinet is meeting for a three-day retreat. Ottawa’s readiness to work with Quebec on its lower targets marks a change in tone for Mr. Trudeau, who had criticized the idea last month. The two governments agreed that senior ministers will meet later this month in Gatineau to work out a plan. The discussions will also aim to reach a deal on compensating Quebec for its costs related to settling refugee claimants who have crossed into the province from the United States between official points of entry. More than 90 per cent of the thousands of people who have crossed into Canada between official points of entry over the past two years have done so at Roxham Road in southwestern Quebec near Champlain, N.Y. The Quebec government is seeking $300-million in compensation from Ottawa, but Mr. Legault said Ottawa is only offering to cover $140-million. Federal Intergovernmental Affairs Minister Dominic LeBlanc, who was in Thursday’s meeting with Mr. Legault, told reporters that reducing immigration at a time when many Quebec businesses are facing severe labour shortages will be a challenge. Under the terms of a 1991 Canada-Quebec deal on immigration, federal funding to help Quebec integrate immigrants will rise even as the province’s total intake of immigrants declines. The federal government announced in November that it will gradually raise Canada’s national targets for annual immigration to 350,000 in 2021, from 310,000 this year. It is not clear how Quebec’s reductions will affect Ottawa’s national targets. Mr. Trudeau did not speak with reporters after meeting with Mr. Legault, but the Premier confirmed that further discussions on immigration will take place soon in Gatineau. Federal Liberals are in Quebec this week to build support ahead of the October federal election. Polls suggest the Liberal Party could pick up seats in the province, which could help offset potential losses in other parts of the country. Several ministers, including Mr. LeBlanc and Infrastructure Minister François-Philippe Champagne, recently toured parts of Quebec to meet with business leaders ahead of the cabinet retreat. They said the clear message is that skills shortages are a major problem. 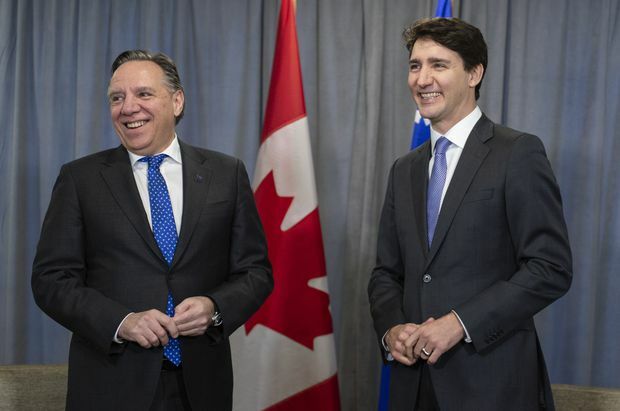 Mr. Legault said the temporary reduction in immigration – which would apply equally to three categories: economic immigrants, family reunification and refugees – will give Quebec time to ensure that it is bringing in people with the right skills. He also said Quebec wants to ensure its immigrants can speak French and support Quebec values. Quebec announced in December that it will reduce the number of newcomers to 40,000 in 2019, a 24-per-cent reduction from 2018 levels. Advocates for immigrants and refugees have called Quebec’s plan cruel. Mr. LeBlanc said last month that Ottawa was “disappointed” by Quebec’s new targets.